Dimensions 1.25 by 6 by 9.50 in. Amazon.com description: Product Description: Providing practical guidance on what remains the single most important statutory basis for police duties and powers in England and Wales - the Police and Criminal Evidence Act 1984 and its Codes of Practice - this is an essential reference source which the busy police officer or legal practitioner cannot afford to be without. The fourth edition includes all recent amendments to the Codes of Practice, including Code A (March 2015), Codes B, E, and F (October 2013), and Codes C and H (June 2014), as well as the full text of the Act and Codes of Practice. Explanatory chapters, covering key areas such as the revised best practice for stop and search and juvenile detention, as well as commentary on interviews and entry, search and seizure, have been updated in line with legislative changes stemming from the Protection of Freedoms Act 2012, and the Legal Aid Sentencing and Punishment of Offenders Act 2012. 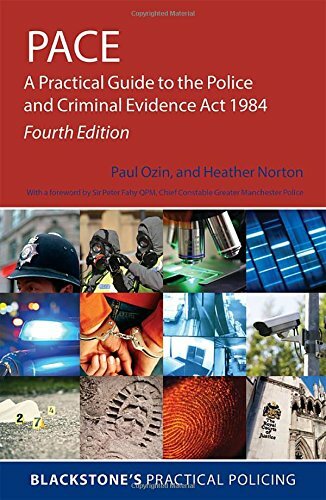 With the aid of checklists, flow-charts, and illustrative examples, this book gives excellent guidance on how the procedures and requirements of the Act apply to common, everyday scenarios facing police officers, as well as other persons charged with the investigation of offences. The book forms part of the Blackstone's Practical Policing Series. The series, aimed at all operational officers, consists of practical guides containing clear and detailed explanations of the relevant legislation and practice, accompanied by case studies, illustrative diagrams, and useful checklists.